War of the terrorist groups? ISIS claims explosives attack on Hamas military post, after threatening war; Hamas is in denial. Islamic State's (ISIS) threats to declare war on Hamas in Gaza after the latter began a crackdown on local Salafist groups appears to be edging to fruition, after an ISIS-affiliate in the Sinai Peninsula on Friday claimed launching two "bombs" - reportedly 82 mm mortar shells - at Hamas posts in Gaza. Ansar Bayt al-Maqdis, which earlier this year swore loyalty to ISIS and changed its name to Sinai Province, claimed credit for the attack on a military post of Hamas's "military wing," the Al-Qassam Brigades in Khan Younis, located in southern Gaza. 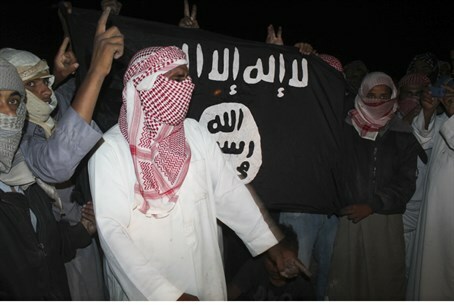 The ISIS forces said they conducted the attack due to Hamas's actions towards Salafists in Gaza, reports Walla!. They warned in a message to Gaza residents: "distance yourself from military and security posts and guard your lives." To the Salafists currently jailed by Hamas, who reportedly have been tortured, they wrote, "we will not give up on saving you." Corroborating the claimed attack, witnesses told AFP they heard explosions close to Khan Younis. But Hamas was in denial, with the spokesperson of its interior ministry Iyad al-Bozum denying to AFP any mortar fire and saying the claim of an attack is "baseless." On Wednesday clashes were reported after Hamas demolished a Salafist mosque, arresting 40 members of the Salafist organization "Islamic State Supporters in Bayt Al-Maqdis." The Hamas move was said to be a response to ISIS's assault on the Palestinian Arab Yarmouk neighborhood in Damascus, during which a senior Hamas official and other members of the group were beheaded. In response to the demolition and arrests, ISIS in Gaza warned Hamas it had 72 hours to release them or else it would kill all of Hamas's personnel one by one. The latest escalation comes after an explosion hit the Hamas general security headquarters in Gaza on Monday, with Salafists claiming credit and saying it was a response to the arrests and torture of Salafists in the Hamas stronghold.